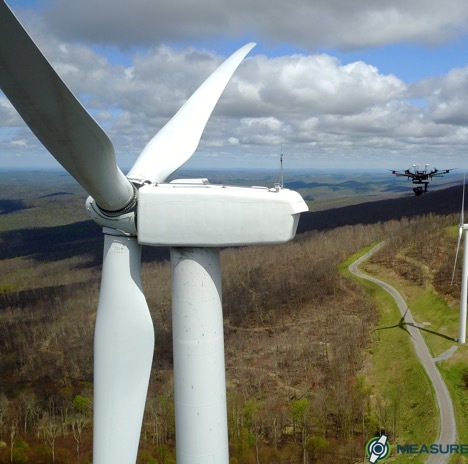 Drone-based inspections provide cost reduction and revenue enhancement opportunities of over $600/turbine when compared to ground-based inspections. The savings value is two folds ($1200/turbine) when compared to corrective/reactionary maintenance. Start by telling us a little bit about yourself and your expertise in the industry. Measure is the nation's leading Drone-as-a-Service® company that specializes in turnkey end-to-end services. We have provided a broad spectrum of drone services to companies in the energy, media, construction, and telecommunications sectors. In the energy sector, drones enable automation of the field inspection work and can do a task quickly and more accurately. Improvement in safety, reduction in hazardous field hours, cost savings, revenue enhancement, and digital asset management are some of the important factors that are driving the adoption of this technology. Our team has developed specialized drone services for inspecting solar farms, wind turbines, power lines, power generation assets like coal plants, providing actionable data to inform asset management and business decisions. For a little background can you outline the current process that may be used for wind turbine blade inspection. To a larger extent, the wind industry relies on corrective maintenance rather than predictive mitigation steps. Corrective maintenance is expensive – unnoticed defects can result in catastrophic failure, resulting in expensive repairs, extended down time of the turbine, and associated lost revenues. A single catastrophic failure on a wind farm can wipe out the savings of not budgeting regular predictive maintenance. Predictive maintenance today relies on ground inspection methods, which involve shutting off the turbines and hiring contractors who either need to physically climb the turbines to inspect them or take pictures from the ground. In addition to the significant safety risk associated with physical climbs, but needing to shut off the turbines for a long duration greatly reduces the output and revenues. Ground inspection with cameras can take upwards of two hours per turbine, which can be reduced to 15-30 min with drones, reducing the down time of turbines by 75% and making the inspection cost-effective. How can a drone be used to improve this process? Describe the process using a drone. Drones can automate the data collection and inspection, making the process cost-effective and reliable. With traditional ground inspection methods, a two-person crew would be able to inspect 3-4 turbines in a single day. A drone pilot can inspect between 12-15 turbines in the same period. Drones can take accurate pictures of the defects by being closer to the turbines than ground inspection cameras that are hundred’s of feet away. As a result, the chances of missing a defect/anomaly is almost zero with a drone. Describe the value of identifying efficiency losses faster and safer and why this is important for a wind farm manager. Our inspections have successfully identified defects that can cause up to 6% productivity loss per turbine, which if gone unnoticed in the ground inspection method can result in $10,000 annual revenue loss. Further, an unidentified defect can result in an unexpected catastrophic failure, which causes expensive repairs, extended downtime and associated revenue loss. Revenue losses alone from these unexpected catastrophic failures can be as high as $50,000 per turbine. How can pictures be identified accurately and more precisely with Drones vs ground inspections? Drones follow a pre-planned automated flights to capture images at regular overlap. This automation reduces the chances of missing small cracks and defects, and produces highly accurate reporting. Ground inspections require manual or semi-automated data capture and picture-taking can only be done hundred’s of feet away from the blade, introducing human error and inaccuracy in data collection. How can the drone data enable digital asset management? Drone imagery enables storing of digital signatures of the asset health. Information from past inspections can be conveniently presented to show asset performance over time. Digital dashboards with key performance indicators can enable an asset manager to perform comparative portfolio analytics. For example, historical information from inspections can inform an asset manager which make and model of blade showed higher failure and fatigue rate. Digital data also allows information to be stored in a secure and efficient fashion compared to 100 of pages of pdf reports from each inspection. Can you talk a little bit about the costs of using drones versus the current method? The drone inspections more than pays for the cost of services when evaluated against these benefits. How about from a job standpoint? Will this replace human labor directly or is it more likely to just change the qualifications and skills involved for this job? Drones are not going to replace human labor. They will make humans more efficient at their day-to-day job. A drone can reduce the time spent on root cause analysis in the field from hours to minutes, freeing up the time of a technician to perform high quality, value-added services or repair work. At the same time, accurate imagery and inspection data from a drone flyover makes it easy and efficient for an asset manager to make repair decisions confidently. Harjeet Johal is the VP of energy infrastructure at Measure and is responsible for managing drone service solutions for power, utility, and energy companies. He holds a Ph.D. in electrical engineering and has over 11 years of experience in power markets, energy consulting, and power system operation. He holds numerous patents and various publications in renewables and utility sector. Prior to joining Measure, Harjeet was a senior manager for energy advisory services at ICF, and held various positions with General Electric in engineering research and consulting. Tim Pfeiffer is a wind solutions specialists at Measure. Originally from Texas, he received his bachelor’s degree in meteorology from the University of Oklahoma and went on to attain his Master's in mechanical engineering from the University of Massachusetts, Amherst. Here he completed and defended his thesis, which was titled, "Incorporating Seasonal Wind Resource and Electricity Price Data Into Wind Farm Micrositing." In August of 2017, he joined Measure and has been involved with the wind turbine drone inspection service side since.